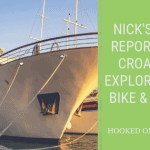 Welcome to Hooked on Cycling holidays and our cycling holiday in Slovenia. This cycling holiday in Slovenia has been graded as a level 2-3 self-guided cycle tour. This cycle tour in Slovenia will allow you to explore the world-famous Triglav National Park and its surrounding region. The most famous landmarks of this tour are Lake Bled with its church on the Island with the Triglav peaks just behind it and its famous castle on the hillside overlooking the lake and town. Another little-known region but just as beautiful if not more so is Lake Bohinj where mountain scenes and tranquillity meet together. If you like mountain scenes but do not want the extreme sport to reach it then this could well be a tour for you. Arrival to Lake Bled the world famous town on the shore of a glacial lake. This is probably the most photographed lake in Slovenia if not Europe! Admire the lovely scenery, the mighty castle on the rock above the town and the little island with a chapel in the centre of the lake. Why not try the famous speciality cake at the Park Hotel, several thousand slices are served each day! First today you have a bus transfer to the Pokljuka high plateau. From here you will cycle down the Bohinj valley. This truly is a place of the unique beauty of nature with tiny villages in the alpine valley. Stop on your way in these tiny villages and take lunch in a Slovenia pub. You continue to cycle through many small alpine villages before reaching the small settlement of Ribčev Laz (Fisherman’s Pass) lying next to stunning Lake Bohinj. As an extension, you can cycle around the lake to the Savica Waterfall, the source of the Sava Bohinjka River, and then take the cable car up to Vogel Mountain for a spectacular view into the Bohinj Valley and of Mount Triglav, the highest peak in the Julian Alps. This is about the only day which results in the grade 3 listing. After a first flat section, you then cycle the slow climb up to the Jelovica high plateau, a pass of 750 m/2400 ft. You will be passing through Sorica a tiny village set in the heart of the hills. It is the birthplace of a famous Slovenian painter. You can visit his art gallery. If time allows, take a swim in the new pool complex in Bohinjska Bistrica. If this ride is too hard then at the welcome meeting you can book a transfer for 20€ per person to be paid locally. Today a long downhill biking trip, then flat crossing Sora field. Before setting out do not forget to visit the old centre of Škofja Loka. You will pass through several nice villages today, Železniki village with remains of old high furnaces, churches with mysterious relics and Kranj the capital of Carniola. The hotel in Preddvor is set on the shore of a small lake, in the summer months a refreshing swim can be taken here before dinner. Today it is mostly flat with a few small hills. Today is like taking a cycle through history. This route will take you along the edge of the Kamnik-Savinja Alps to Radovljica with its beautifully preserved old town and an interesting beekeeping museum. Your route will also take you through the fascinating little village of Kropa where you will find the iron forging museum dedicated to the history of the town’s blacksmith trade. You can even learn how to make your own nail, and ether adds it to the current collection of over 100 types, or take it home with you. We suggest lunch in a small restaurant near the castle in Radovljica. Day 6 – Begunje to Kranjska Gora 27 miles 44km. This route will take you along the edge of the Kamnik-Savinja Alps to the historic village of Begunje. It was in this small settlement where one of Slovenia’s darkest moments took place. Visit the Museum of Hostages and learn how thousands of men, women and children were beaten and executed during the German occupation in WW2. On a lighter note, Begunje is also the hometown of the famous Slavko Avsenik/Oberkrainer band. 2kms down the road are the ruins of Kamen Castle. As the sun illuminates the mountains your route will take you on cycling path that goes between the ranges of the Julian Alps and the Karawanke Mountains to Kranjska Gora, a popular alpine town famous for its ski resorts, but also a great base for many summer activities. Along the way, you can take a short side trip to the lookout point for Spik Mountain, regarded as one of Slovenia’s toughest peaks to climb. If you arrive in plenty of time you can take a ride up to the Planica Valley, location for the world-famous ski jumping championships. Cycling downhill through the Radovna valley to the foot of Mount Triglav. One pass of 150m/500ft today as you make your way through the Triglav National Park. Experience the stunning mountain scenery at the end of the Krma valley. The valley is a peaceful area of deep woods, touching monuments from World War two and old farmhouses; one has been transferred into a museum, which has been visited by Prince Charles! This is not a mountain bike tour. It is suitable for people with average fitness levels. There is one pass of 750m/2500ft. However, you have all day along a quiet road.